We then went to St. Markàs Basilica - very ornate with lots of gold mosaics. The gold color comes from a mixture of gold leaf and glass. The Basilica had served as the private chapel for the Doge. This church is also called The Golden Basilica. We had a group luncheon with great pasta, mystery meat, a nice dessert and som of the best wine yet. 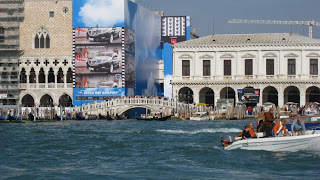 Later many of us took a gondola ride through the Grand Canal. Others went shopping for more gifts (for ourselves and those at home). We then took the water taxi back to the bus and headed home for a late group dinner at 9:30 at the local restaurant. Very nice place, I wish I could live there.I have never been there and after reading your blog I am preparing to see this place.Thanks for the amazing post.